I started this painting a couple of weeks ago from a photo I took in Palenville, and worked on it a few days since then. For some reason, it seems to have taken me forever to get this one off the easel, but I think it is finally done. Fifty years or so ago, you’d have seen the grand Catskill Mountain House looming on the escarpment to the right of the peak of South Mountain. Today it’s just an amazing view from up there that extends for hundreds of miles, and takes in over sixty miles of the Hudson River. The spring melt cascades down the mountain in streams and waterfalls that gave Palenville its nickname as “The Village of Falling Waters”. 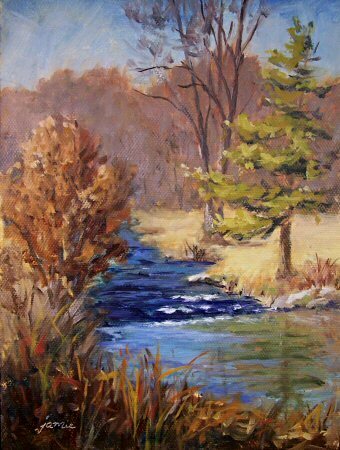 This painting was done with a limited palette of Raw Sienna, Cadmium Yellow Primrose, Red Iron Oxide, Ultramarine Blue, Phthalo Blue, and Titanium White. For some reason, the left side of the sky looks darker than the actual painting. It’s always impossible to get the digital image to exactly match. The room lighting must have been darker on that side when I snapped the picture! $75.00 plus $10 shipping and insurance within the Continental United States. For local sales, shipping charge will be allocated to NYS Sales Tax. Please email me at JamieWG@aol.com for International purchases or with any questions. Every so often, I like to play with paints and ideas like a child in a sandbox. 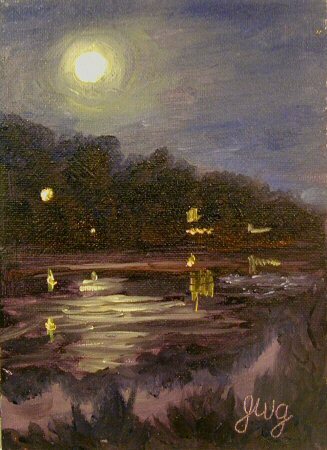 Today I did some small plein air paintings, experimenting with different styles and ideas. 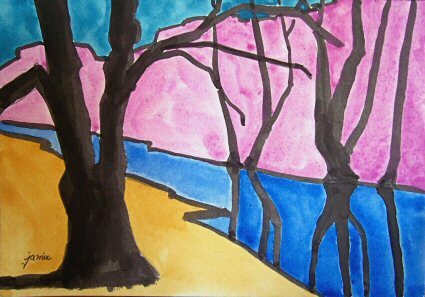 This abstract landscape is based totally on design and composition. The idea was to support an energetic design with bold contrasts, adventurous colors, and strong lines. 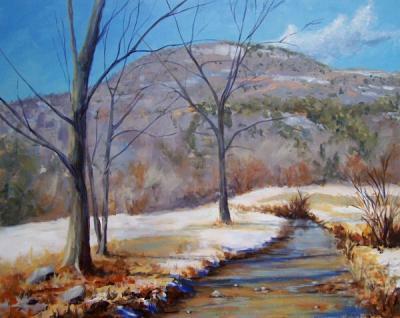 I looked for elements in my yard along the brook, and arranged them for a dynamic composition. 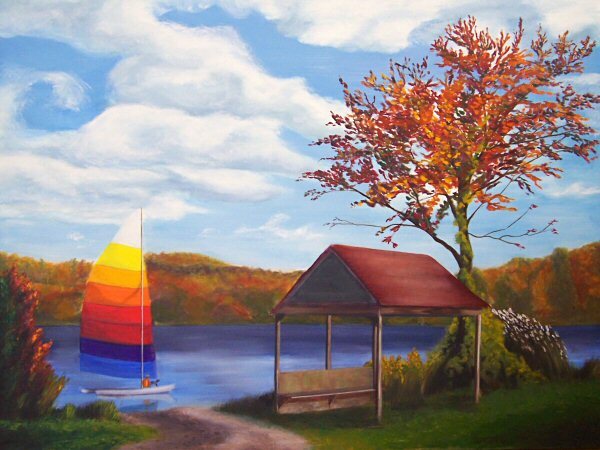 I examined the color of each large section of the landscape, and selected a pure, higher-chroma color to represent that segment of the painting. The colors are cerulean blue, cobalt violet, cobalt blue, and raw sienna, plus waterproof black India ink applied with a brush. I’m sure I didn’t need so many colors to portray this subtle landscape, but they were already on my palette, so I figured I’d put them to work! This magnificent spot, with the red barns nestled in the valley below the Catskills, is about five minutes from our house. There are mountains and rolling fields everywhere you look. Locations like this one are what make me realize why the Hudson River School painters were so drawn to this area! It was only 26 degrees yesterday morning when I painted this, so it was done from the warm comfort of my car, parked off on the side of the road! $85.00 plus $10 shipping and insurance within the Continental United States. For local sales, shipping charge will be allocated to NYS Sales Tax. Please email me at JamieWG@aol.com for International purchases or with any questions. Monochrome studies are such a great way to work on values. When I don’t have time to do a full-color painting, a monochrome sketch is always a good way to spend the time. 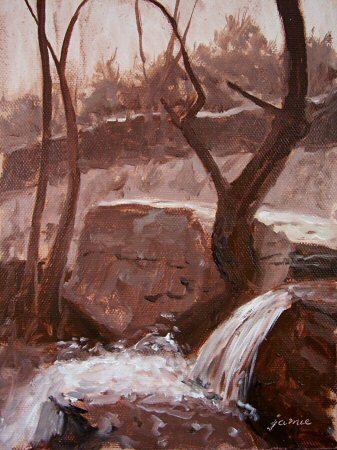 I mixed together leftover paint from a morning painting to create this reddish-brownish-purplish mix, took a seat on the nearest rock, and used that with titanium white for an oil sketch of a small waterfall. 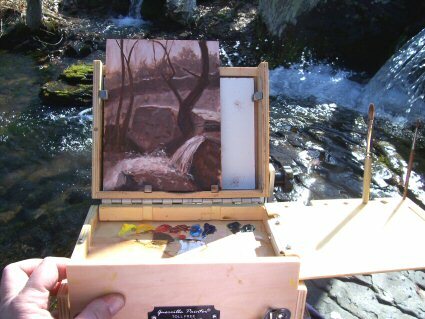 Here’s a photo of my Guerrilla thumbox at work with this painting! Isn’t it the cutest thing? It holds everything I need for small paintings. 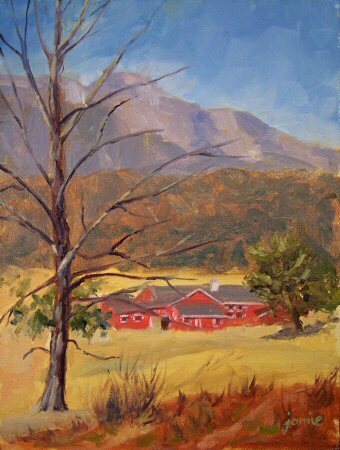 This painting was done from a photo I took at Muscoot Farm in Somers, NY. Too cute! 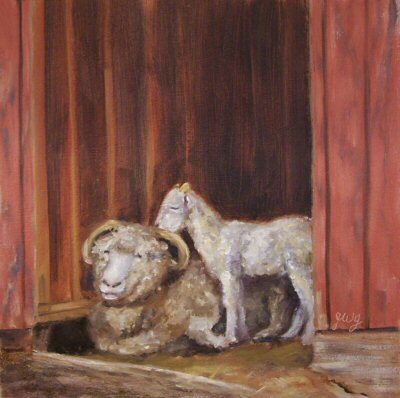 Spring is just around the corner, and that means the baby lambs are on the way. This studio sale price is over 65% off! $1,050.00 plus $65 shipping and insurance within the Continental United States. For local sales, shipping charge will be allocated to NYS Sales Tax. Please email me at JamieWG@aol.com for International purchases or with any questions. 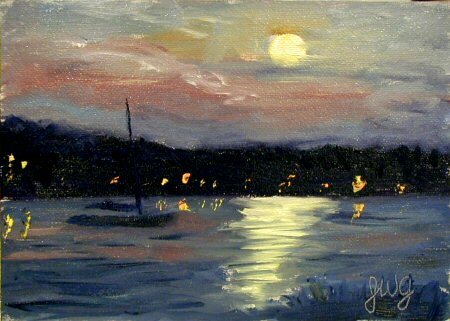 This is an older painting that has never appeared on my website nor in a show. I just took a picture of it yesterday for the first time. My style has changed quite a bit since I painted this. I thought it would be interesting for my viewers to see something I did many years ago. I am offering this huge painting for sale now for the first time, and at a great price! A couple of years ago, there was an amazing sunrise over the lake on a winter morning. I grabbed my camera, dashed out the door, and took hundreds of photos for future paintings. 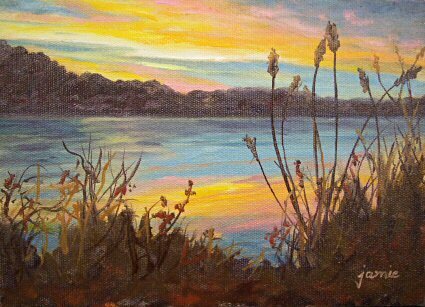 Here is another painting of the “Majestic Morning” series, just off the easel. I didn’t really need all those colors to do this painting, but since I’d put them all out on my palette, what the heck! I dipped into everything.